I should say we could be overscheduled because in all honesty, I am not allowing us to get there. 1 yr ago - He looks so small! The K-Man as you know has been in Tae Kwon Do for over 1 year now. He has done really well, earned 4 belt levels and can break a board with his foot like nobody's business. The problem with TKD is that it isn't seasonal or sessional. They want you to sign up for a year contract. Yep, you read that correctly - sign a 4 year old up for a 1 year contract. Crazy talk, right? At first, we did only 3 months, then extended it another year since he seemed to like it. However, I am so DONE with going 2 days a week. It was simpler when Mini-Me was younger, less mobile and less vocal. She too is DONE with the whole thing. We have to get in the car when it is freezing to drive 5 minutes, sit in a tiny waiting space and she isn't allowed out on the big mats where the kids are doing fun things, then 30 minutes later back in the carseat. I literally spend my time keeping her occupied and no longer can watch the cool stuff the K-Man is learning. On a side note, she does entertain everyone with her "hi-yas" and calling for her brother. Truthfully, I think the K-Man is over it too. He doesn't ask for it, or get all excited when I say to get ready. When I asked him if he wanted to continue, he said, "Well, I would like to earn that black belt". I tried to explain that could take 2 years, but the concept of years is still lost a bit on him. Our contract ends June 1st and we have decided to not renew. 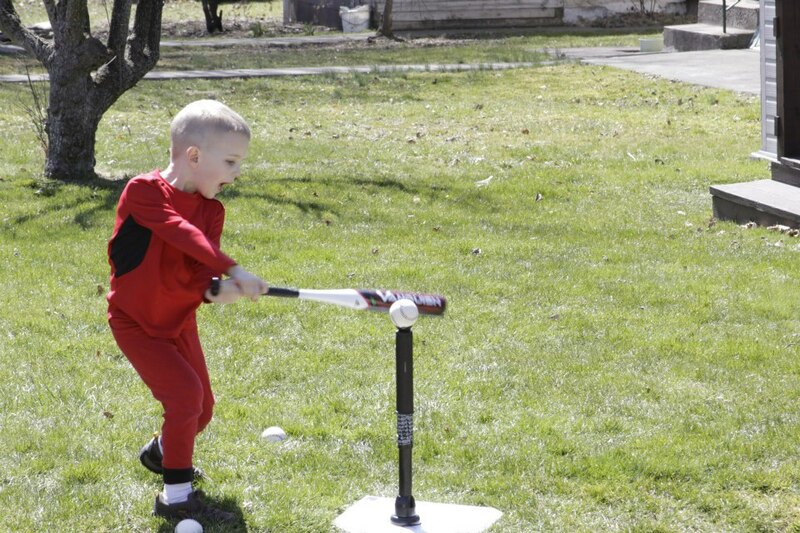 T-ball starts this month, and we want K-Man to try other things. If we did both, then we would literally have 4 nights a week taken up with activities for him. It just doesn't seem practical. I would be a crazy woman trying to feed the kids and get them to everything. And there is of course, the dragging of the younger sister to MORE things not for her. So I guess it isn't only about overscheduling him at the moment, but also me and Mini-Me. We are actually excited about t-ball since it gives us more opportunity to be outside. Mini-Me loves outside time and she will have a little more freedom than a small TKD waiting room. K-Man seems pretty interested so far and we haven't made it to a practice yet. The Mister bought him a tee, bat and balls when in WV for Easter. They played all weekend, and he is pretty good at hitting. Actually, right now, he seems to be a switch hitter. I guess I shouldn't be surprised since he golfs lefty, but you just never know. Better yet - t-ball is completely seasonal, and has an end. Woot! Oh, you have no idea how the kids' schedules will one day take over your life. Enjoy the control you have now. Hugs.